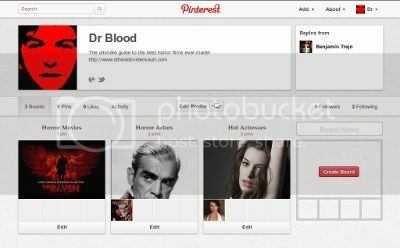 I'd been toying with joining Pinterest for some time and finally gave into the temptation a few hours ago. Even though I'm not an 80 year old woman who crotchets her own yoghurt, I thought I might find something interesting on there eventually. 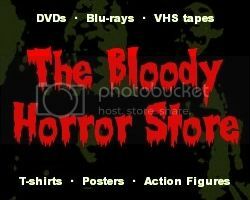 Some Spaniard with no posts at all had already taken my usual screen name of "drblood" and I couldn't be "drbloodsvideovault" either because there are too many letters in it. Of course, hyphens or underscores don't work so, after several minutes of frustration and wanting to delete my account, I had to call myself "drbloodspins". That stands for "Dr Blood's Pins" not "Dr Blood Spins", just so you know. I'm not completely sure what it's all about yet, but here's a screencap of what I've managed to achieve so far. Yeah, you can tell that I'm hugely popular among all the fairy cakes, seashell jewellery, and knitted teapot cosies. As if I didn't belong to enough time-wasting social networking sites already, now I have to figure out how Pinterest works, get thousands of followers, and, presumably, become their god. Apparently, I can click a button on my browser's bookmarks bar now and steal all the pictures from websites. 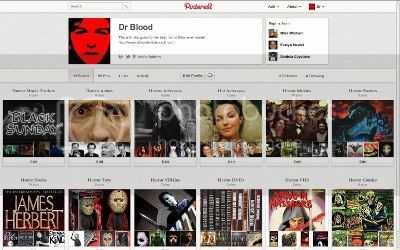 By trial and error, it seems that Pinterest really is just a site for posting up pictures and videos which people have stolen from other sites on the internet. Then, if you're really lucky, someone will steal those pictures and videos from you for their own board, and get a load of comments after them while yours remain uncommented. I suppose it's a bit like Blogger then really, but for lazy people who don't know how to use a computer. I don't think this is going to drive any more traffic to my blog, but they did give me another nice little badge to clutter up my sidebar with. If you have a Pinterest account, feel free to follow me or steal my pics. I bet you all want to follow me now!